A Russian citizen, permanent resident of the US, lives in the US and travels to Russia 3-4 times a year for about a week or two. Since most convenient flights for her habe an intermediate stop in Europe (e.g. Frankfurt, Helsinki, Paris, Milan, Reykjavik) she would like to exit the transit area of the airport and spend a day or two in the country of transit. At present, she applied and received multiple short-term Schengen visas from Finland, Sweden, Iceland, France and Germany (about 5 total). However, despite her requests the visa was always granted in the C-1 category (30 days validity) single or double-entry. The visa process is very time-consuming (collecting all the paperwork) and has to be planned many months in advance (waiting line for German consulate is 1.5 months as of today). She, to the best of my knowledge, has always complied with the visa requirements, has a reasonably well paying job (>$100K) and some property in the US. However, each and every time the visa granted is C-1 with 1 month validity and with the duration of stay for tje exact duration of transit +1 day. Why? What is the secret to obtaining a multiple-entry Schengen visa with at least half a year validity? It turned out that receiving a MEV does not mean it is in any way a long-term one. The next visa received is a MEV, but for the exact duration of the trip: 14 days. PS. This question partially overlaps with this one. However, the forms were always filled requesting multiple entries, so the answer provided in the linked question is not sufficient. Pick a country that's likely to give out multi-entry visas in the first place. We have a question on this topic already. 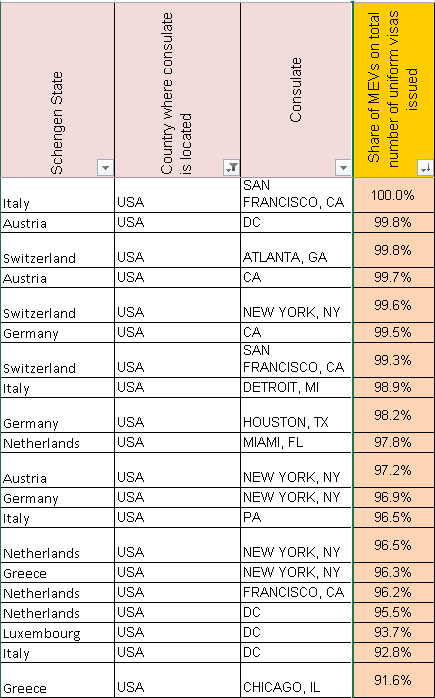 Make sure to check out this multi-entry statistics table and only apply at the consulates of the countries at the top. That's very important since technically multi-entry visas are not supposed to be issued for tourists, as outlined in the Handbook for the processing of visa applications and the modification of issued visas - section 9.1.1.3. Number of entries. Plan a tourist trip to the country of your choice and ask for a multi-entry visa, showing your previous transit visas as proof of your established character. Don't mention the word transit anywhere in the application - remember that tourism should be your primary purpose of visit. If you successfully get a visa at the first attempt, fly to the country as planned, spend a few days there, and then head to Russia. Try to visit the same country again a couple more times before you apply again, just to make sure you're not seen as a 'visa shopper'. If you don't get a multi-entry visa at first, still fly through that same country, however on your way back to the US you will need to avoid exiting the transit area. Apply again afterwards and it's extremely likely that you will finally get the right visa. I'm a Russian citizen and US resident as well. My advice to you: always apply for a Schengen visa in Russia! I have had 1 and 2 years multi-entrance Schengen visas, and now I got a 5 years one! This would never happen if I apply in one of the US embassies. For some reason, they're giving out short visas only (I've heard this before, that's why I never go there). Not the answer you're looking for? Browse other questions tagged usa schengen russian-citizens or ask your own question. Schengen visa for multiple visits, how to fill out the forms?